I've been eating my fair share of quesadillas since it's naturally a gluten free dish, that is, if it's made with corn tortillas. I find the corn tortillas provides a nice texture when toasted up, not to mention a great rustic flavor that flour tortillas don't have. For this variation on a quesadilla, I used a raw Mexican chorizo which is readily available at latin grocery stores and most supermarkets (near the meat section where the sausages are located.) This recipe using the soft kind that is often packaged in a cellophane casing. When cooking, the texture is like a very soft ground beef with more moisture. You'll need to cook this in a skillet first before using in the quesadillas. When it's time to assemble the quesadillas, I like sandwiching the filling so that the cheese is up against the tortillas to help seal everything together, while the cooked chorizo and fresh cilantro is in the middle. Play around with quesadillas because they're a great way to use up random ingredients and come up with delicious filling combinations! Preheat a nonstick skillet or griddle pan to high heat. Add oil. Crumble in the Mexican chorizo and cook until cooked through. Remove from skillet and set aside. In another nonstick skillet over medium high heat, toast a corn tortilla for 20 seconds, flip. Cover half the tortilla surface with shredded cheese, bits of cooked chorizo, and cilantro. Add another sprinkle of cheese over the chorizo/cilantro layer then top with another corn tortilla. When the bottom tortilla is toasted and cheese is melted, carefully flip the quesadilla to cook the other side. Press down gently with a spatula to get all the filling sandwiched together. 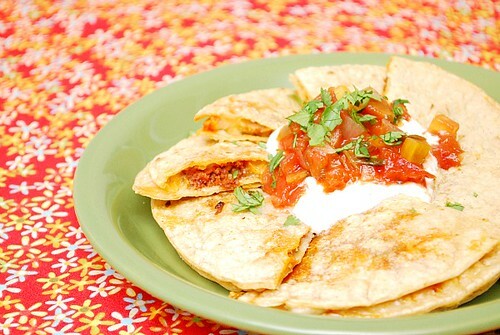 Remove the quesadilla from the skillet and cut quesadillas into 4 wedges; top with salsa and sour cream. Repeat with the remaining filling ingredients and corn tortillas. For salsa, combine ingredients in a small bowl and spoon over wedges of quesadilla, as you snack. 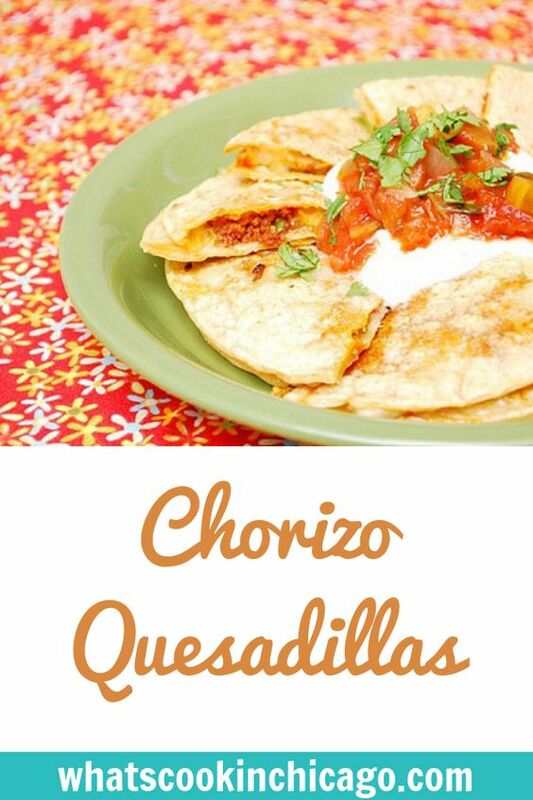 This quesadilla sounds amazing! I love quesadillas becaues they are so versatile. Lately I've been making a lot of tostadas.